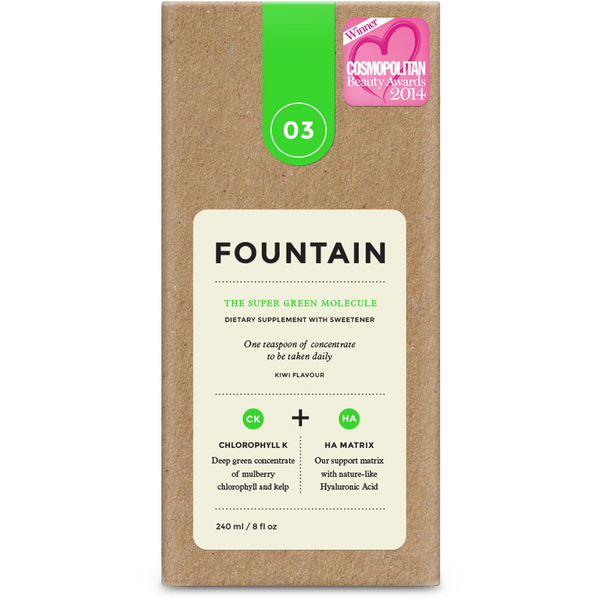 The Super Green Molecule from Fountain contains alfalfa chlorophyll to improve red blood cell count and oxygen levels in your bloodstream, which in turn aids detoxification and cellular repair, whilst kelp includes over 40 minerals, 16 amino acids and 11 vitamins which help to boost internal tissue hydration and aid weight management. Boasting a delicious kiwi flavour, the supplement also contains hyaluronic acid which regulates and preserves moisture within tissues. Designed to improve your overall health and well-being, it's suitable for both adult men and women. - L.M. 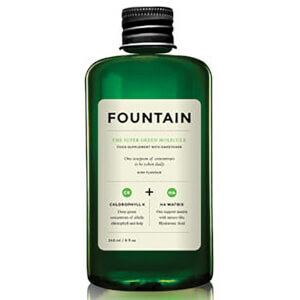 Water, Sweetener Xylitol, Atlantic Kelp Complex (Water, Glycerin, Atlantic Kelp Powder), Natural Flavour, Preservative Citric Acid, Sodium Copper Chlorophyllin, Hyaluronic Acid, Preservative Potassium Sorbate.